On Monday we had our final Swedish lesson in a series of four that we’ve held over the past six weeks. We already had some great feedback from the first three lessons, and had learned a lot about what works, what doesn’t, and how we can make it even better. I wasn’t sure if many people would show up for the final lesson; but in fact, we had more than any other previous lesson, and from an amazing range of countries: Turkey, Iraq, Pakistan, Japan and Scotland are some that I remember. I’ll be writing up our findings properly in the coming weeks, but here is a quick preview of my thoughts: There is a lot of demand for Swedish lessons out there from people who don’t have easy access to such lessons; immersive distance learning works, but the learning curve can be steep; it’s important to have structured lessons; and finally, instead of just asking people to show up, a better model may be to have people apply, and then use Second Life as the immersive aural part of a course, complemented by worksheets and video that they can watch at their leisure. But we’ll see — it certainly is promising to be able to reach people who would otherwise never have any “face time” with a live Swedish teacher. Finally, there was also a film crew from SVT, Swedish television, in the room when the lesson took place. Look out for a report by them next week! This entry was posted in Second House of Sweden, Update. Bookmark the permalink. Thanks again to you guys for doing a brilliant job on this! 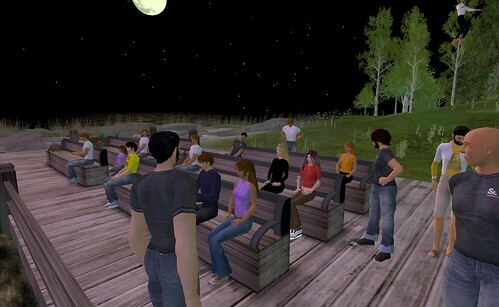 I would be very interested in serious courses in Swedish in Second Life – Svenska A och Svenska B, kanske? I would be very interested in courses in Swedish in Second life, please inform me what to do? I am VERY interested in Swedish lessons please! Let us know when the next classes start?